On November 3, VerdeXchange Institute co-hosted Ontario Premier Kathleen Wynne, welcoming her to LACI's La Kretz Innovation Campus for a conversation with CARB's Mayor Nichols and former California ISO Chair Bob Foster, moderated by Waterloo Innovation Summit Chair David Fransen. Los Angeles Mayor Eric Garcetti opened the program. Here, VX News presents edited excerpts from the conversation. Santa Monica Mountains Conservancy Founding Executive Director Joe Edmiston is among the original champions of the LA River, who long understood it as an opportunity for green space rather than simply a concretized channel. Now, Edmiston expresses his support for Frank Gehry joining these ongoing efforts. Edmiston also comments on the California drought and its impacts on parkland. Jeff Kightlinger, general manager of the Metropolitan Water District of Southern California, updates VX News readers on a new initiative through MWD and the LA County Sanitation Districts: a demonstration project that could lead to one of the largest recycled-water projects on the West Coast. Kightlinger notes that, despite this endeavor and other efforts to utilize local water, Southern California will continue to rely on imported water. He touches on progress at the Delta to increase reliability of that supply. California’s four-year drought has brought a tangle of interests, conflicts, and questions regarding state water practices to the fore. At the intersection of these issues, and perhaps uniquely equipped to address them, is Delta Watermaster Michael George. Here, George delivers a comprehensive overview of the matters he oversees in the Delta: the adjudication of water rights, urban versus agricultural water interests, the environmental challenges of water distribution, and the pros, cons, and future of Governor Brown’s tunnel plan. Finally, in light of so many recent local and state initiatives regarding water use, George considers which goals are actually achievable. Waterloo Summit: What Drives a Successful Innovation Ecosystem? Formerly Consul General of Canada in Los Angeles, David Fransen has frequently joined VerdeXchange to discuss the commercialization of clean technology and to consider the close trade relationships between California and Canadian provinces. 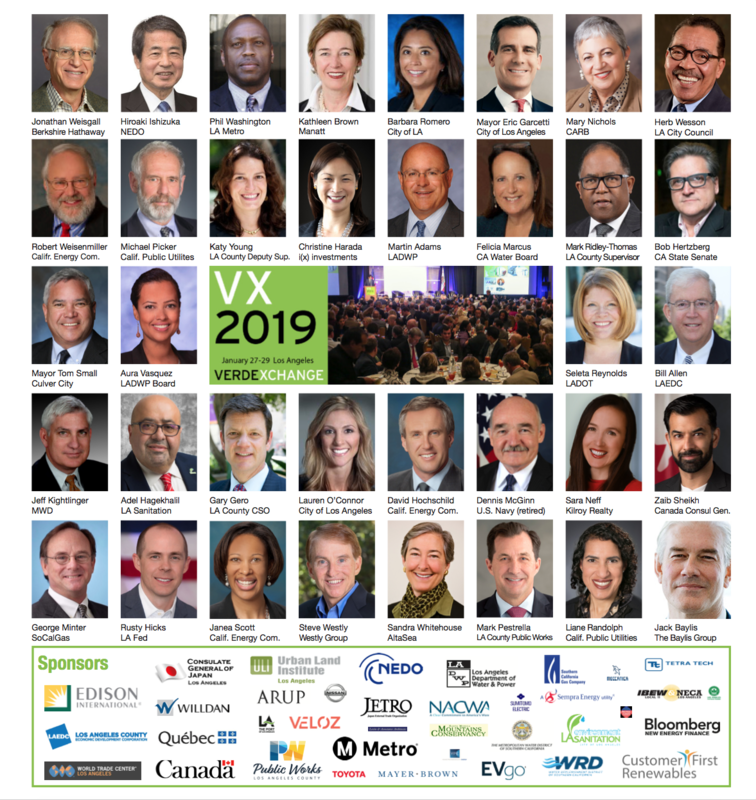 Now, Fransen returns to VX News as chair of the annual Waterloo Innovation Summit in Ontario, which occurred in September. Fransen recaps the summit and outlines Ontario’s rapidly growing innovation ecosystem. Read more about Waterloo Summit: What Drives a Successful Innovation Ecosystem? Chai Energy, Inc. is a Los Angeles-based startup reimagining the "Internet of Things" space. Chai CEO Cole Hershkowitz spoke with VX News about the company's remarkable growth since he sat on a VerdeXchange 2015 plenary panel in January. He highlights Chai's focus on data interpretation, noting that the company begins by looking at the problems people encounter with their devices in the home. Helping resolve those issues, Hershkowitz explains, results in reduced energy consumption and savings for customers. Richard Kauffman is leading New York State's ambitious effort to transform energy delivery. As chair of energy & finance for Governor Cuomo and chair of the board at the New York State Energy Research and Development Authority, Kauffman is deeply involved in reforming regulations, as well as "changing the paradigm" of how government supports renewable energy and energy efficiency projects. 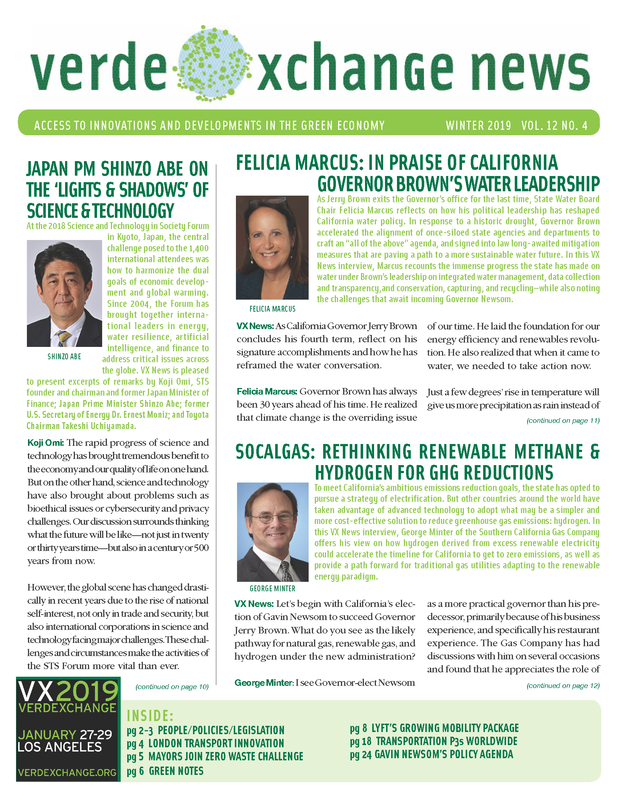 VX News sat down with him to glean lessons learned that can inform related efforts in California and across the nation. Mayor Eric Garcetti and Governor Jerry Brown welcomed mayors and governors from across China and the United States to Los Angeles in September to sign the US-China Climate Leaders Declaration. The document focuses on the role of sub-national governments in setting ambitious climate-change goals and then meeting those targets. Here, VX News presents edited excerpts from a press event at the US-China Climate Leaders Summit, featuring a collection of US mayors and Governor Brown.